Beto on Texas vote turnout: It’s a conspiracy? Readers of this blog know that I admire Beto O’Rourke, the former West Texas congressman who nearly got elected to the U.S. Senate in 2018. Hmm. Here’s my take on it. I believe Texans at times suffer from a case of “voter fatigue.” It’s also a bit of a cultural phenomenon that afflicts suppressed voter turnout here. The lowest percentage of turnouts occur in states that formerly comprised the Old Confederacy. Does that mean we care less about the health of our form of government that citizens who live in high-turnout states such as Wisconsin, Oregon and Washington? No, it doesn’t mean that all. Texas’ Constitution establishes a lot of electoral offices. We vote for our entire slate of statewide constitutional offices every four years; those elections occur during those “midterm” years. We vote for municipal and school district offices every odd-numbered year. If we live in a community college district, we get to vote on boards of regents, too! 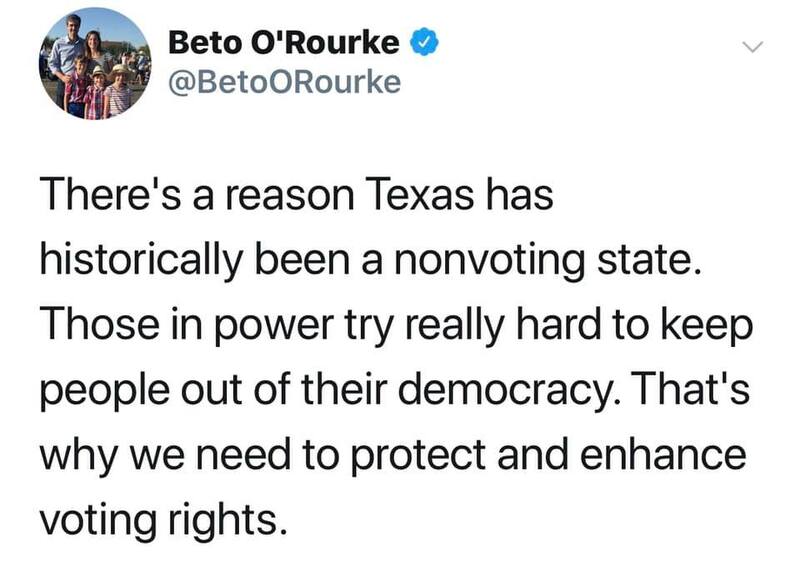 O’Rourke blames this lack of turnout on the ability of “those in power” to suppress voter participation. I believe that is an overly cynical view. I remain a voting traditionalist. I prefer to vote on Election Day when I’ll be at home. I am no fan of vote by mail, which some states require; it’s been said that the high turnout in Oregon and Washington is a direct result of those states’ mail-voting provisions. I would like to see Election Day turned into a national holiday. I would like to see state, local and federal governments conduct intensive public-service campaigns to encourage voter turnout. As a voting junkie, I enjoy the prospect of standing in line at my polling place and waiting my turn to exercise my constitutional right of citizenship. I just cannot buy into Beto’s belief that the lack of turnout in Texas is the result of some dark conspiracy. What now? Well, Beto might run for president in 2020. Maybe he can channel the enthusiasm he generated in his near-miss loss for the U.S. Senate in Texas into a national wave. That would dispel any conspiratorial notion, correct? Although I did not vote for O’Rourke, I voted. I feel that everyone who is a citizen has the right to vote as they see fit. They also have the right NOT to vote. I tend to vote for the candidate I feel best represents me. The one thing that I don’t tolerate is the “Cry Baby”, the candidate that cries “No Fair” because he didn’t win. In every election there is a winner and a loser. Unfortunately Beto was a sore loser in a tight election. Even if I were a Beto supporter in a previous election, I might not be, in the next election, just because of his attitude after the election. I’d have more respect for Beto if he just accepted the results, shook hands with Cruz and waited until next election to run again. I feel a politician, when he loses, should man up, shake the hand of the winner and say congratulations. Support the winner when he does things that are right and criticize him when he does things wrong . I do that either way. And believe me, I don’t always agree with my candidate.